We thoroughly enjoyed our stay in this wonderful condo. It's well appointed and quiet. The property is gorgeous. It's up some very steep roads with no sidewalks so make sure to have a designated driver at all times or use taxis. Our host was the Best kind with so much helpful information for us. Since we arrived after 11 pm at night, the agent met with us early the next day with the groceries that we ordered. She explained all that was necessary to know, and then gave me a lift to the jeep rental place and had me follow her back so I would be familiar with the way. The pictures did not do the villa justice. Beautiful views and facilities. Very responsive to any issues that popped up. The welcome book was very useful. Great stay. Villa Monza was beautiful!! Looked just like the pictures. 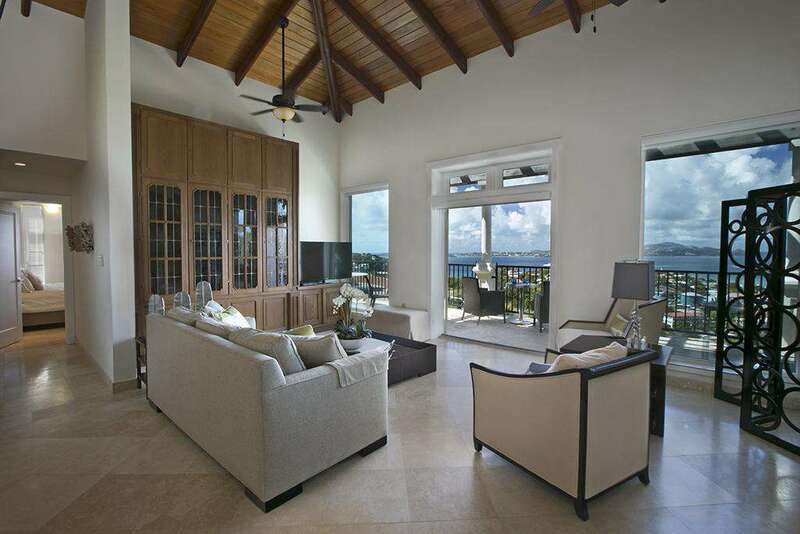 Beautiful decor with an amazing view of Cruz Bay! Each bedroom had an attached bathroom with shower so plenty of privacy if you're with a big group. The hosts were excellent and responded promptly via email. They provided linens, towels, shampoo, conditioner, body wash as well as beach towels. A cooler and beach chairs were also provided. We would definitely stay here again!!! We enjoyed our stay at Villa Monza! We considered the Westin Resort as well but the value of lodging received at Villa Monza surpassed what the Westin had to offer. The Sea Glass Team was professional, courteous and flexible. The ocean view from Villa Monza is extraordinary. I will return and I'm going to recommend Villa Monza to others within my network. My wife and I stayed at Villa Monza with two other couples in February. St John was wonderful. We considered several locations throughout the Caribbean and Mexico and we were glad we chose St. John. The villa was in a perfect location. The villa was great. The staff as Seaglass was very helpful. They quickly to question before the trip and they were easy to work with. We ordered food through their website, which was also convenient. It was nice to have a stocked kitchen after traveling and arriving late. Our visit to St John between Christmas and New Years was a perfect vacation to relax, swim, go to restaurants and take an amazing New Year's Eve boat trip to "Foxy's:" with the help of the talented staff at Sirenusa. The Villa was well equipped and extremely comfortable. My college age son was very entertained and we met some amazing people. Most of all our hats are off for the staff at Sirenusa for bending over backwards to help with every little thing quickly making us feel at home and comfortable on this beautiful island. Villa Monza was gorgeous. 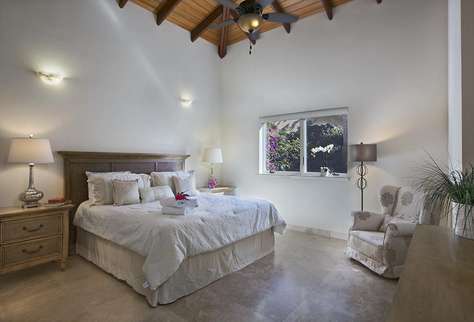 The property is large, with high ceilings, and wonderful furnishings. 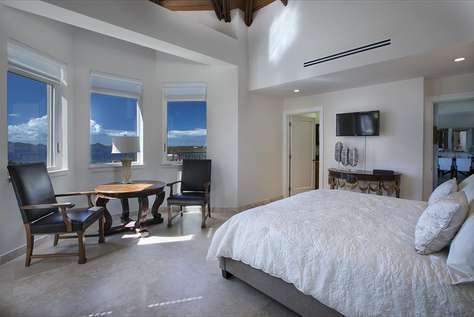 Each bedroom has its own bathroom, and there is even a powder room off the living room. Everyone at Sea Glass was extremely helpful and attentive. We loved the gorgeous view of Cruz Bay from our balcony. 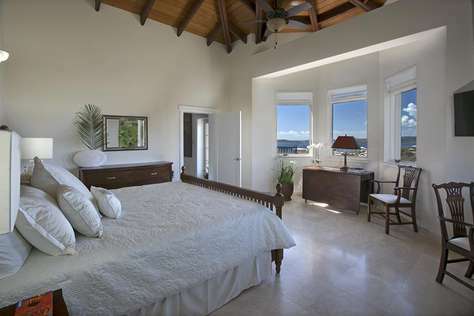 The Villa is perfectly situated, within a five minute drive of downtown Cruz Bay. Highly recommend! We stayed at Sirenusa in the Monza unit in August 2015. We selected the place mainly because we were traveling with a couple of friends and a 2 year old and wanted something close to town with nice amenities. This place went above and beyond our expectations! Dealing with Nicole and Kristen at Sea Glass was both a pleasure and very helpful. They answered all of our detailed questions and worked out the logistics of getting our jeeps to the villa waiting for us along with many other details. They even had some beach toys at the villa for our 2 year old daughter along with chairs and a cooler to take to the beach each day. Which we definitely took advantage of! 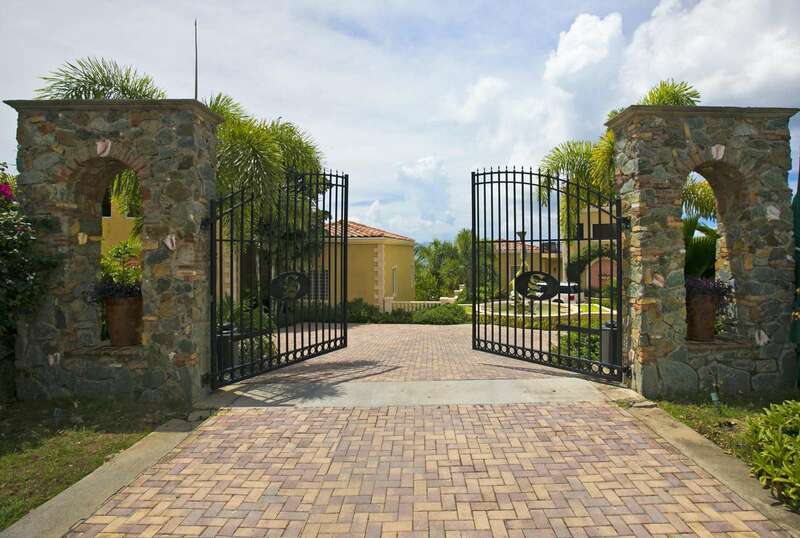 The moment we pulled into the gated resort we could tell it was very high end. 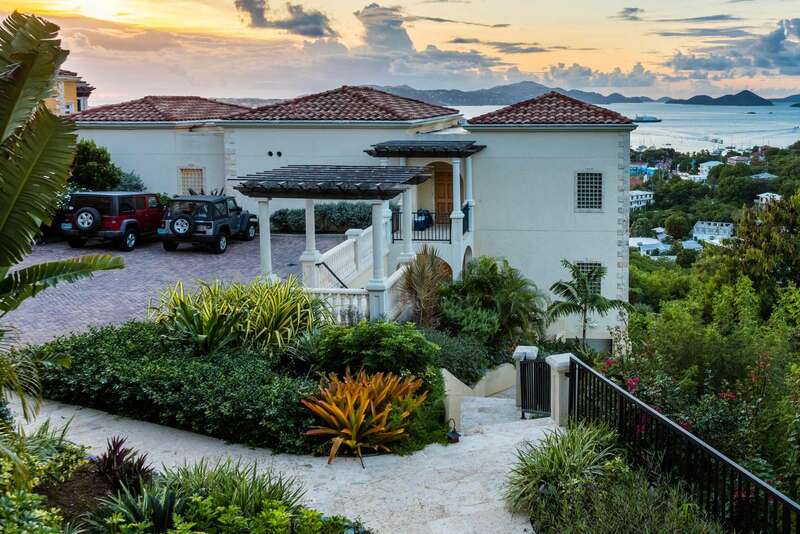 Situated high above Cruz Bay the grounds were very well landscaped with brick paver roads, tiled walkways, beautiful villas, and a very serene feeling. When we walked into our unit at Monza it looked better than the pictures. The view across to St. Thomas through the windows and from the balcony was amazing and afforded us spectacular sunsets! When we could get home in time that is!. 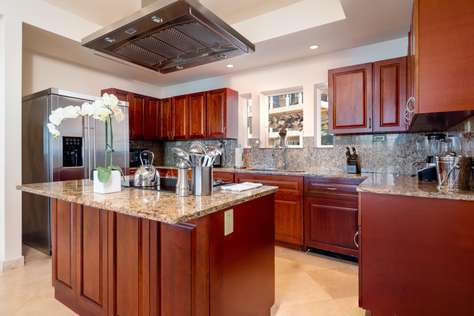 The finishes of the unit are all high end from the travertine floors to the granite counter tops in the open kitchen. 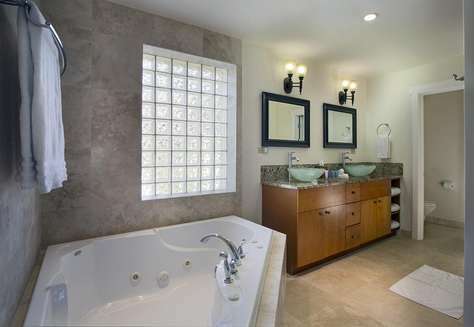 The 3 bedrooms were all large and each had their own full bath. 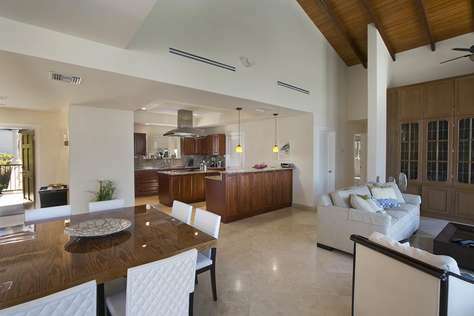 The central area had a great living and dining room with a large table capable of handling large families and groups. The furniture was all of high quality as well and plenty of seating inside and out. The beds were very comfortable and we always had hot water (not always the case in other places we stayed in St. John). We felt that Monza and Sirenusa was the perfect base camp for us. We love exploring and traveling all day long on hikes and going to different beaches. We snorkeled every day and went to a dozen different beaches. At the end of long days coming back to such a nice place in the evening was so nice and relaxing so we could be refreshed to start over the next day! We used the workout facility, the rec room, and hung out a few times on the common area patio that had great views as well. Never felt crowded. Like we had the place to ourselves! Just a short 5-10 minute drive to town. a 5 min. drive to Starfish market and Chelsea drugstore. The nice central location to things made it easy to come home and shower after a long day of sun and sand and then head out to dinner without having to take a long time in travel or go places all scuzzy. 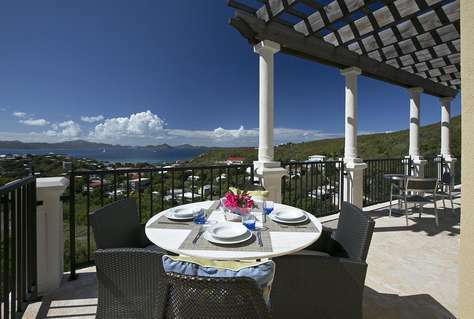 We have been to St. John several times and have stayed at individual villas elsewhere there and have enjoyed them all. I have to say I highly recommend Sirenusa overall based on ease to get to, traveling with family and friends, the amenities, the finishes and views, and the overall comforts of home. One big thing to us was a pool on the grounds but no direct access to it for our 2 year old which was the concern of many villas as she does not swim yet. That made us more comfortable when she wandered around the villa and is a big plus to any parents traveling with little ones. And all at a very affordable price! In fact I can't believe how great the price was. It truly made us feel special and was an amazing vacation for our family. We weren't sure how it would go with a 2 year old but it couldn't have been better and we will definitely go back. Already planning when and which unit we will get next. Many have their own pools too for older kids. 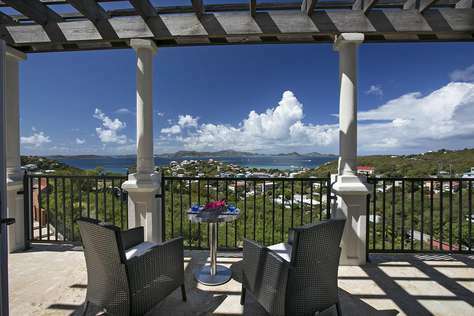 YOU won't be disappointed in your St. John experience at Sirenusa! Our group of young couples stayed here and have absolutely no complaints. The villa is beautiful and has everything you could possibly need. The full gourmet kitchen was great and we cooked several meals in it. The balcony has incredible sunset views that we hurried home for each evening to make sure we did not miss. 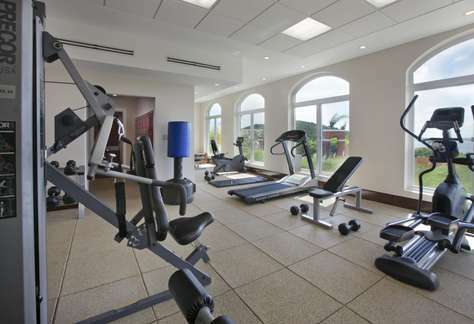 The pool is adequate and the exercise room was surprisingly equipped with a variety of free weights and other machines. The management team sent someone to meet us upon arrival and introduce us to the island and must-see beaches/restaurants/etc. Overall it was the perfect spot to spend a few days on St. John. Andrea and I had such a wonderful time this past week visiting St. John. I sincerely appreciate all you did to make us feel comfortable and welcomed. It couldn’t have been a more relaxing week and the lovely condo was such a big part of our experience.